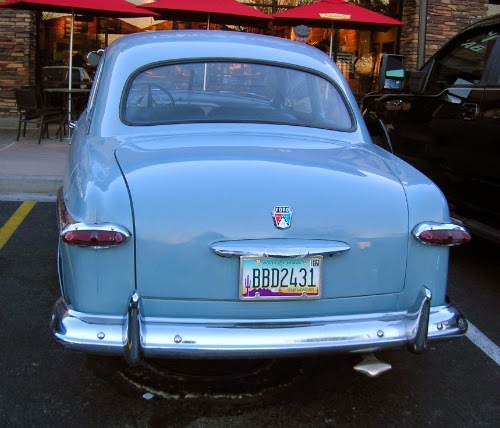 Yet another great car spotted on our Arizona trip. 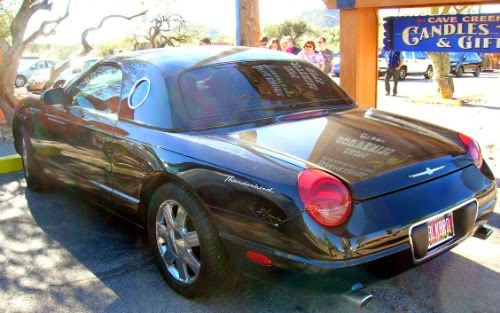 This one was at Cave Creek. While it’s not the special edition package (that only came in “Cashmere” colour), I like this sleek, retro convertible. 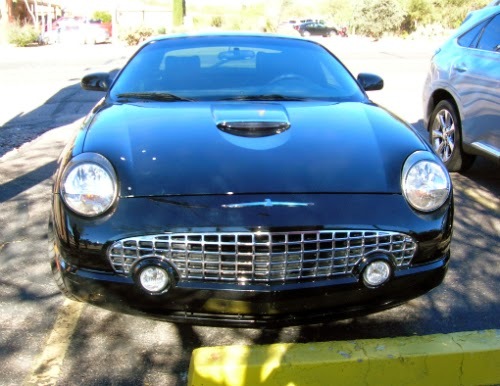 Not only is it an anniversary edition (although they weren’t made for 50 years consecutively) but the 2005 was the last T-bird produced. The porthole window is a nice touch, even though it didn’t turn up until 1956. For a mouth-watering description of one of the special edition cars (sold, alas! ), see HERE. And here’s the official Ford page on the last of the T-birds. 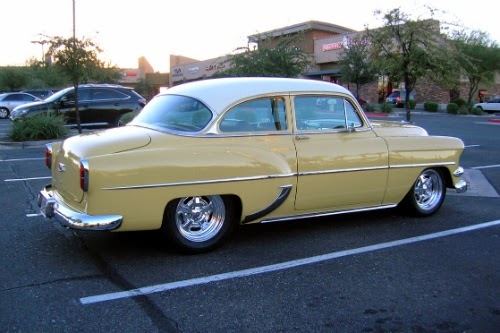 Spotted this the morning after the Chevy I last wrote about, in the same parking lot. Wanted to go back there again for breakfast the next morning to see if we’d be lucky three times in a row, but that was Christmas and we were expected somewhere else. 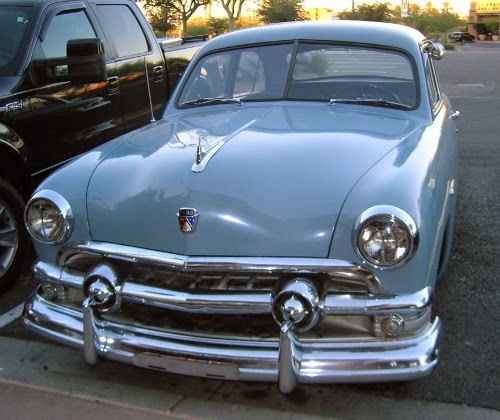 Here’s a link to a page on Automobile Catalog that has specs for all the 1951 Ford Deluxe Tudor sedans. Automobile Catalog looks like an interesting resource. Their aim is to provide information on all cars produced since 1945, and they're currently working on those starting with N. They even have software to figure out how fast cars could go that were never officially tested. Saw this beauty in a parking lot in Phoenix over the Christmas holidays. Unlike the Chevy Bel Air, which seems fairly common at car shows I attend, I’m not sure I’ve seen one of these before. 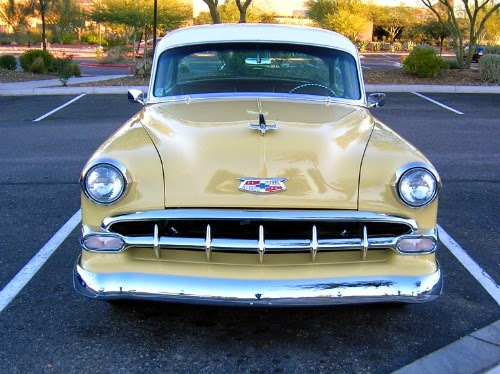 According to Wikipedia, it was the best-selling Chevy in 1953 and 1954, but soon lost out to the flashier Bel Air, as people no longer felt the need to continue post-war economizing. But the limited edition, in Guardsman Blue with Wimbledon White stripes is probably already sold out by the time you read this, as they’re only making 50 of the big block Cobra. Or maybe not, as some assembly is required. And they’ve been making versions of it ever since. If you want to get your hands on one, you can either have an authorized dealer put it together for you, or do it yourself. It comes as a rolling chassis, minus the drive train, with a 1965 MSO. Sounds like the ultimate garage project. Pricing starts at $119,995 for a fiberglass version and $179,995 for the aluminum one. Naturally, they come with special badging, and will be entered in the World Registry. The press release I got had no photos, but for photographs and more details, check the Shelby American website. So I’m informed by our car dealer, anyway. Despite my requests, I’ve not been added to the official press list for the show. Shrug. Anyway, if you’re shopping for a new car, the show is running from Friday, January 16 at 10 am to Sunday, January 25 at 7 pm, and as usual is at the Palais des Congrès. You can find more details on their website. Looks like they’ll be featuring the Performance Zone again this year, so if you like modified cars, check it out. One of the fun things about travelling is renting a car and getting to drive something different. 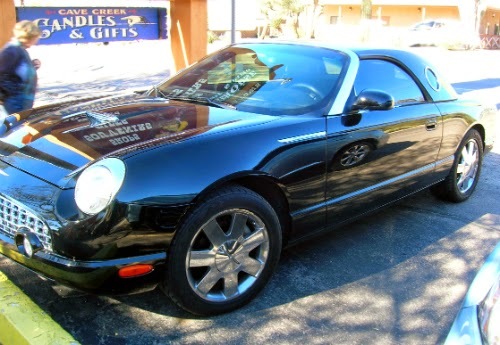 So when my husband said we’d need to rent a car when we were down in Phoenix, I figured it was an opportunity to drive something extraordinary and sent him a rental website to look at. Later that day he told me he’d reserved us a Mustang convertible. Woo hoo! Ever since I was a kid, I’ve wanted a convertible. I was crushed in the 1970s when they temporarily stopped making them. I’ve never owned one, however, because we’ve never had more than one car, and we have to deal with winter. This was my chance! Only trouble was, my experience with rental agencies is that you reserve one thing and then when you show up, they don’t have it and you end up with something else. Like a minivan. So when we got to the parking garage to pick up our as yet unidentified vehicle and saw the group in front of us picking up a minivan, with another one sitting behind it waiting to go, I was apprehensive. Uh, oh, I thought. Here it comes. “…or would you rather have a Camaro convertible?” Yes, really! We dithered back and forth for a few minutes and ended up taking the Mustang. And even though it never got above 60 degrees the week we had it, we did have the top down more than once (everyone must have known we were from out of state). Driving down the interstate with the sun shining, cactus in the foreground, and mountains in the background was fantastic. I’m still smiling. Here’s a link to a Zimbio quiz on matching car photos with their appropriate movies. Didn’t do that well myself, as I hadn’t seen (or in some cases even heard) of at least half of the movies, but unlike so many quizzes, the answers aren’t confined to stuff from the ‘90s and later. Enjoy! You might not think an airport would be a good place for spotting cars but there often is one on display. 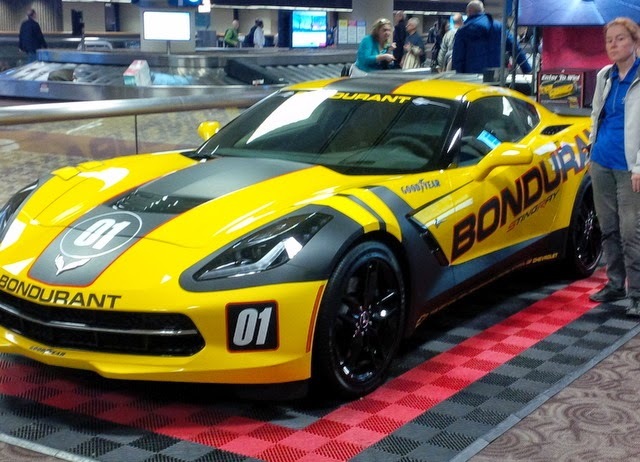 This particular one was in the Phoenix airport, advertising the Bob Bondurant School of High Performance Driving in Chandler, Arizona. According to their website, it’ll do 0 to 60 in 3.8 seconds. Of course, you’d have to get it out of the terminal first. Also spotted a very nice 2015 Lexus in the Toronto airport as we were passing through, but didn’t have time for photos.